Following a successful transition meeting last month the Digital Apprentice project has moved from Discovery to Alpha. 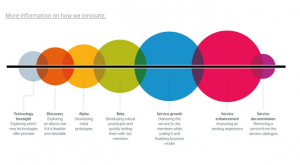 In the discovery phase we explore new ideas and emerging technology to establish which ideas meet Jisc member’s needs, are technically feasible, fit Jisc’s remit and stand a chance of becoming sustainable services. If an idea passes all these criteria, we move to the alpha phase. The Digital Apprentice has been looking at three-way communication between employer, provider and apprentices following the introduction of the employer levy for apprenticeships. As employers increasingly look to ensure they are maximising investment in their staff through the levy they are increasingly likely to be contracting with a wider range of providers, whilst wanting to look across their entire cohort of apprentices to monitor activity and plan progression. As part of the discovery phase we developed dynamic guidance for apprenticeship providers on embedding technology in design, delivery and assessment http://ji.sc/apprentice-journey-v1 which will be online Jan 18 (watch this space for more news). So now we enter the alpha phase. Our focus is now on developing the data infrastructure which we will build on top of the learning records warehouse to facilitate multi provider dashboards for employers. We will develop the tri-partite dashboards with a small number of organisations to iterate and see whether they offer real world benefits. If they do, we move onto the beta phase.